In urban canyons where tall buildings on both sides occlude sunlight, pollution, too, is prevented from dispersing. The Clean Ride Mapper is an interactive map that allows cyclists to choose quieter cycling routes with reduced traffic and pollution levels. After inputting starting point and destination, users are shown three color-coded routes—green being the cleanest (as measured by cumulative exposure to nitrogen dioxide and ultrafine particles from fuel combustion), blue the most direct, and red the quietest as gauged by average traffic density the cyclist is likely to encounter. The map is powered by a dataset of air quality indices acquired over four years using $60,000 air-quality sensors attached to bicycles ridden by Montreal residents. 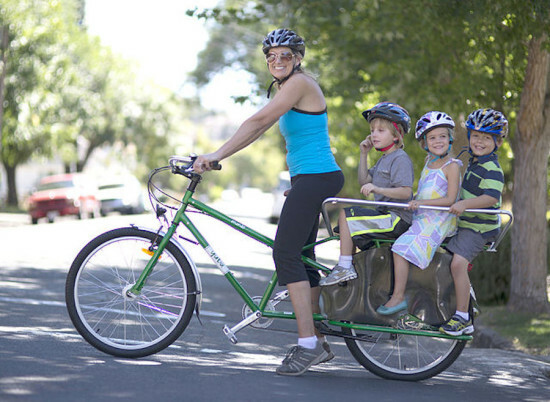 While the routes occasionally overlap, there are times where cyclists must choose between an expedient journey or a roundabout ride for the sake of reducing pollutant deposits in the lungs. Maria Hatzopoulou, the creator of Clean Map Rider, claims that these detours are rarely longer than one kilometer (0.6 miles). 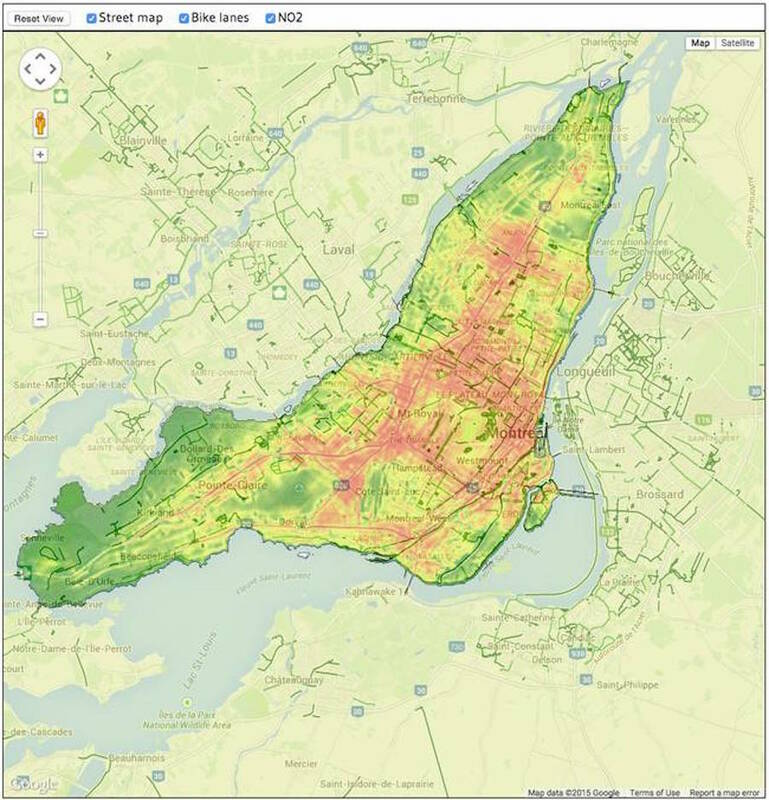 Assistant professor of civil engineering at McGill University, Hatzopoulou created the online tool for cyclists in Toronto and Montreal as a project for the Transportation and Air Quality Research Group. “On certain days, some of Montreal’s most popular cycling paths, such as the one along the Lachine Canal, are also the most polluted because of wind patterns and proximity to highways,” a news release from the university stated. Considering its on-the-go user base, an obvious shortcoming of the fledgling tool is that there is no smartphone app, and users must click around—with repeated zooming in and out—to approximate their origin and destination rather than inputting an exact address. However, the map’s finer points are in the social pressure it exerts on cyclists to contemplate the smog they inhale every day. 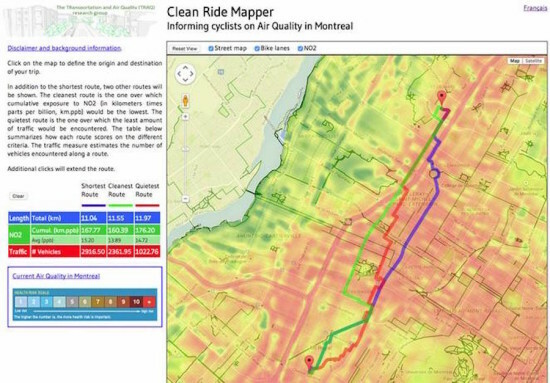 Clean Ride Mapper’s news release further cautions that traffic intersections fraught with idling cars also tend to be epicenters of pollution in cities. 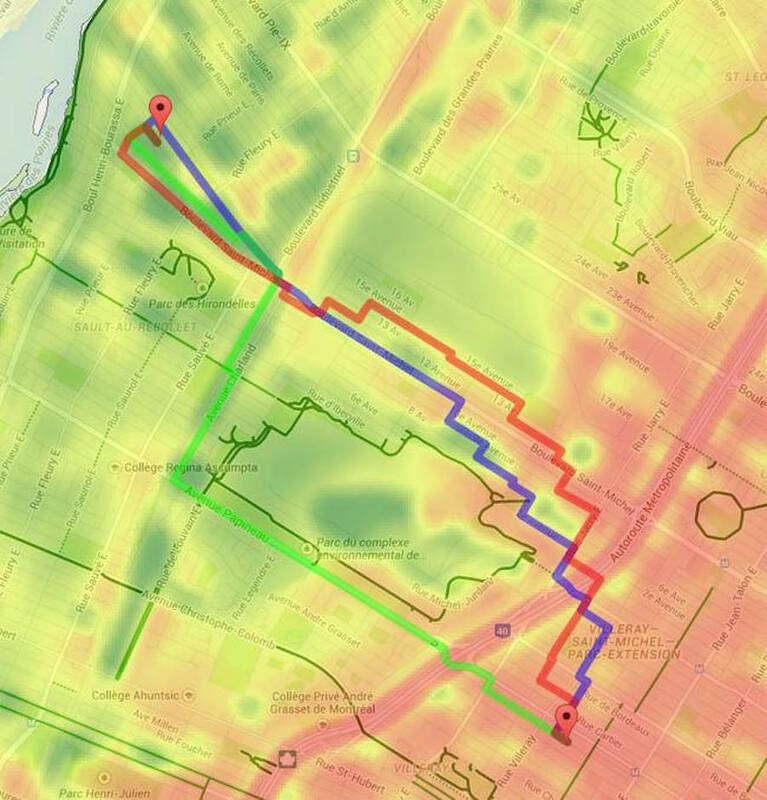 A similar project led by Columbia University in partnership with New York’s local NPR station, is being executed in New York City, whereby dozens of cyclists will be recruited to don air-quality sensors to accumulate data on bikers’ exposure to air pollution.